For this month's SRC assignment, I had a real treat. I was assigned Marie's beautiful blog Not Enough Cinnamon. I feel like we're kindred spirits of sorts. Apart from our love for food, like me Marie moved to Australia a year and a half ago and loves her new home. "Hi Marie, it's nice to meet you!" Her blog is chock full of gorgeous pictures and awesome recipes. I can wait to try out her Pea and Mint Soup and her homemade Nut butters. But those endeavours will have to wait till I get back home. This months post comes to you from Mumbai. We're visiting for a short while and are trying to cope with moving from what was a beautiful autumn to a scorching hot summer here. I needed something to cool down. So I opted for her Banana Peanut Butter Yogurt Popsicles. I loved the idea and I was very sure my mother had a set of popsicle moulds, so I went ahead and made it. As luck would have it, I couldn't find those moulds I was so sure I knew were around, so I did the next best thing. I decided to make some mini pops :) I set these in an ice cube tray and used little toothpicks for sticks. They turned out to be really cute miniature portions. Just between you and me, I tried it out as a smoothie with a splash of milk added to the blender with the rest of the mix and it was yum. You can taste the peanut butter and the banana and to me that it a wonderful pairing. 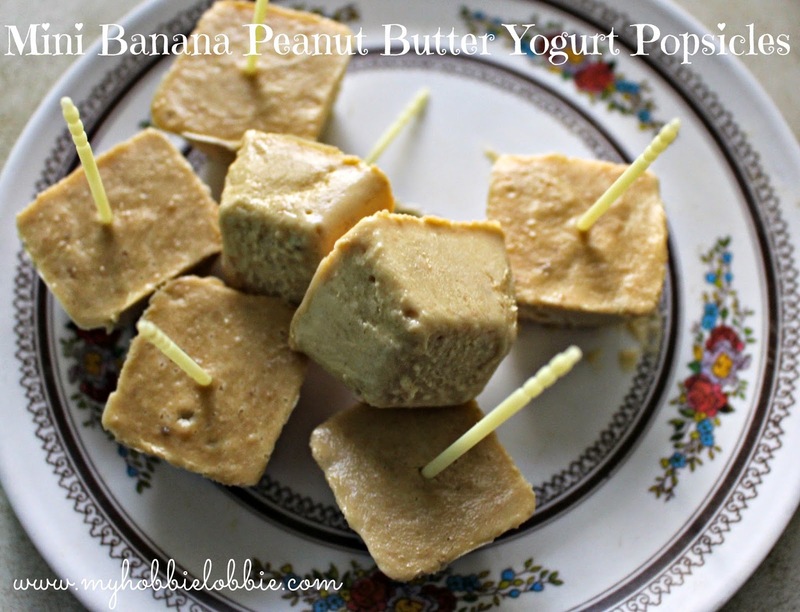 I know a lot of you are headed into summer soon, so go ahead and cool off with this lovely popsicles that could serve as a little snack too since all it has is banana, yogurt and peanut butter. Blitz all the ingredients together in a food processor and set in popsicle moulds. If you'd like to try it out as a smoothie, add a splash of milk to loosen it to a smoothie consistency. Thanks for stopping by Amanda ... glad you enjoyed it! What a great healthy treat for the summer. Great SRC choice! Oh i must invest in some lolly sticks - what a great idea. You are so committed carrying on with SRC when you are in Mumbai - Fair play to you! Thanks Helen ... you are very kind! These look and sound brilliant and have added them to my must do list for next Summer!